Nick Schultz | The Phoenix Loyola pitcher Keenan Dolezal throws a pitch against Northwestern. The Loyola softball team started non-conference play 15-4 — its best start since 2017. One consistency throughout the hot start has been the pitching staff. The Ramblers have the fourth-best ERA at 1.25 — down from last years 2.75 team ERA. The staff, consisting of seniors Kiley Jones and Keenan Dolezal and sophomore Madison Veres, has tallied 90 strikeouts and held opponents to a .215 average. The improved numbers could be because a new pitching coach, Jackie Manrique was hired to fill the void June 27. 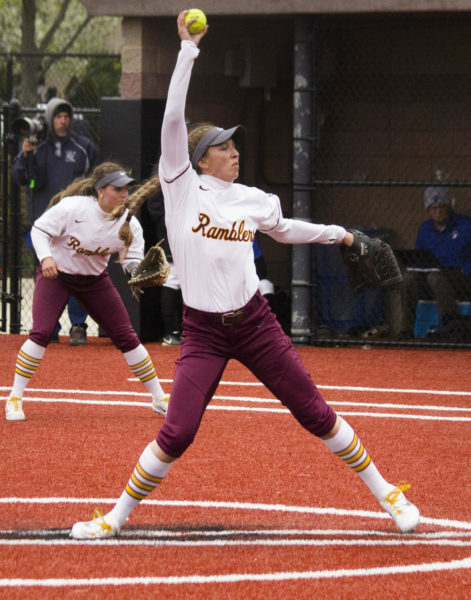 She replaced former Rambler Brittany Gardner, who’s now a social worker and coaches pitchers part-time at an athletics company in south suburban Orland Park after two years at Loyola. Before coming to Loyola, Manrique was a pitcher at St. Cloud State University in Minnesota, where she battled an injury her junior season. Afterward, she became an assistant coach at North Park University in Chicago, before finally becoming the head coach at Trinity Christian College in south suburban Palos Heights. Nick Schultz | The Phoenix Senior pitcher Kiley Jones winds up to throw a pitch. Manrique, a Chicago native, played for local travel teams growing up. At one point, she played for the same program Loyola assistant coach Lauren Moore and head coach Jeff Tylka were part of prior to their times at Loyola. After her time as a player, she said she wanted to pursue coaching and began to explore it while getting her master’s degree. At that point, she was hired at North Park while also working a full-time job at a marketing firm. Though she had a career, she realized during that time coaching was her true passion. Her time at Trinity Christian was her chance to shape a program. She said with an increase in responsibility came self doubt as she often woke up worrying about a different area of her job she didn’t feel strong in, but she said she also learned a lot in this role. 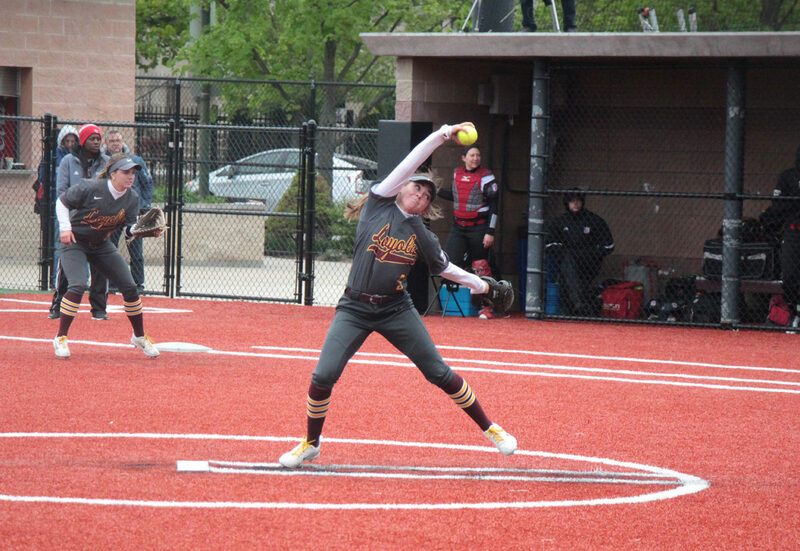 When the opportunity to coach pitchers at Loyola came up, she said she was excited to apply, because that was the area in the sport she felt strongest teaching. In her senior season, Dolezal has enjoyed success, tossing 51.2 innings with a team high 41 strikeouts. She said she’s developed with each year and each pitching coach she’s worked with as she grew up, but she thinks this year has been different with the addition of Manrique. Nick Schultz | The Phoenix Loyola pitcher Kiley Jones throws a pitch during the 2017 MVC Tournament. Another pitcher who’s had a strong start is senior Kiley Jones. She has led the team in innings and wins, and she shared the same sentiment about her new pitching coach. She said she feels the majority of her success has come from Manrique’s focus on developing her mechanics, and she feels the personal impact of her coach. Beyond the motivation of the players, Manrique has implemented more structure and purpose to her coaching. She has her players set goals and provides them the opposing teams’ trends and statistics to put their performances into perspective. She said she feels her greatest impact has been working more to develop a relationship with her new players. Loyola is set to play a three-game series at University of Evansville March 23-24.